July 3, 2018 - Following years of Iran’s regime enjoying the results of appeasement seen practiced on both sides of the Atlantic, the mullahs’ are now facing a very new and extreme crisis. With protests escalating across the country, reports indicate the Trump administration is now weighing the possibility of blacklisting the Revolutionary Guards (IRGC) as a Foreign Terrorist Organization, FTO. The IRGC acts as the backbone of the Iranian regime’s economy, with reports indicating this entity controlling nearly 40% of all economic matters. The IRGC is also the main force behind the mullahs’ domestic crackdown and foreign meddling in countries across the Middle East, and throughout the globe. To this day the sanctions imposed already have decreased Iran’s oil exports and sounded an alarm bell among major international corporations, with dozens abandoning the ship, so to speak, and declaring an end to their business contracts with the Iranian regime. This includes Total Oil, Boeing, Airbus, and Siemens, to name a few. Iran’s economy is crumbling, seen in the falling value of its currency, the rial, against the dollar. While official government rates are fixed at 42,000 rials per dollar, no currency exchanger is willing to provide US dollars at such prices. As a result, the actual price witnessed on the streets have reached 90,000+ rials per dollar. Mainstream media report the uprising witnessed in January, the truck drivers’ nationwide strike, the Kazerun revolt, Tehran’s Grand Bazaar strike and the recent water shortage crisis that resulted in enormous unrest in Khorramshahrand other cities in the southwest are economically motivated. While to some extent true, the chants heard from the people in these “economically-motivated” protests are very telling. “Death to Khamenei” and “Death to Rouhani,” in reference to Iranian regime Supreme Leader Ali Khamenei and President Hassan Rouhani, respectively. “Not Gaza. Not Lebanon. My life for Iran,” referring to the Iranian regime’s foreign meddling. This represents the Iranian society's readiness and demand for regime change. It is now high time for the international community to clarify its position of standing alongside the Iranian people or continuing the shameless policy of appeasing the ruling mullahs. 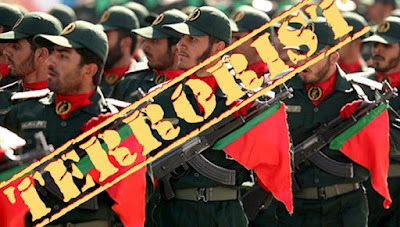 By imposing sanctions on the regime and now specifically considering the IRGC as a Foreign Terrorist Organization, all governments should take this opportunity and send this very telling message to Tehran’s ruling mullahs.